This table is my main work area. You can see my paper drawers and many years ago our best friend, who owns a dental supply company gave me this dental cabinet. It has been used for lots of things, but now it holds all my supplies; stamps, tools, embellishments, etc. 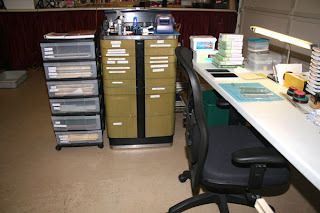 I have each drawer labeled so I don't forget where it is or where I need to put it.